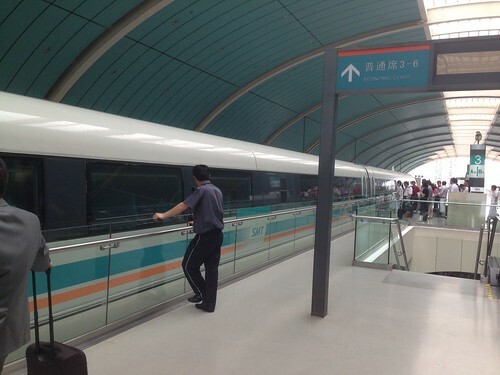 I heard a lot about the Maglev (magnetic levitation) train in Da Hu that I decided to take a ride on it to the airport. I read it a few years ago that it was supposed to connect the two airports namely PuDong and HongQiao airports with nearly 60km between them. Travel time from airport to airport? 7 minutes. So imagine my disappointment when I heard that project failed to take off (too many kickbacks?) and sank. What eventually came up was a line from town to PuDong airport, leaving HongQiao airport in the cold. That probably explained the empty counters at HongQiao airport that says "PuDong airport check-in". So anyway, the ride to the airport was RMB 40 (SGD 8) and wow. It was a very fast ride. 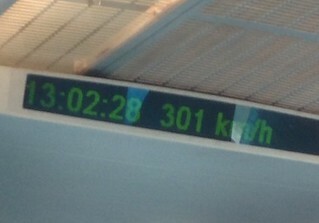 Speed topped at 301 km/h. I heard from my colleagues that it used to go up to 350 km/h until the fatal accident at Wenzhou, killing more than 40 people and a shitload injured, back in 2011. Thereafter, all high speed trains across the country were ordered to reduce their speeds. The ride was very stable and we passed another train along the way, running in the opposite direction where our relative velocity was what? 300 x 2 = 600 km/h?!. I like the part where the train had to tilt sideway as we banked around the corner. The ride was over in a matter of minutes as I reluctant got off the train. Wish the ride was longer.